Not so long ago, perhaps even only 10-15 years, media focused discourse-surrounding health and disease was one where hereditability and the nature of our (the human) genome were misunderstood. The messages that have been perpetuated, and still today quite often surround common belief, are that our genetics determine everything from personality traits and temperament, to disease and disorder, and are concrete and unchangeable. That is, the belief that familiar association of genes is determined and fatalistic. 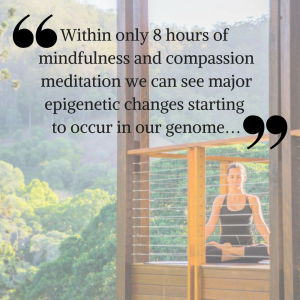 And, while in part this has a truthful element to it, the current genetics revolution and our deepening understanding of holistic wellbeing allows us, the “layman”, to fathom the depths of genetics and what our genome actually means to our holistic health: that in fact, we have the capacity to change the karmic fate of our genes. Genomes & Genes: What the? In order to fully fathom the context of the genome in relation to your health and wellbeing first an understanding of the underlying mechanism of our DNA, Genes, Chromosomes, and our Genomes are best described more completely. To begin with we can understand that our genome is a complete set of instructions – the building blocks to the unique individual – a set of “hereditable instructions” passed from one generation to another. From that we can conceptualize that a specific gene is a component (of the chromosome) that holds the “instructions” to one specific element of our functioning. Further, if we progress one level deeper, our DNA can be likened to a series of “text codes” placed in an explicit order that are converted into messages that enable individual functioning. Our DNA is within the instruction file (genes), and their code order is the key to inheritable differences. Hence, we can begin to understand from this description why the notion of hereditable disease and disorder may have been seen as fatalistic. If the text code is maladaptive then it can only be reproduced and converted into maladaptive messages – or can it? The writing is not always on the wall. As technological advances continue to expand our understanding of what it means to be human, research begins to prove what ancient texts and prophetic leaders have taught for centuries – We are not tied to fatalism. Indeed, humanity is somewhat of a paradoxical continuum whereby the past is not who we are. Rather, the past lives within us and we are who we cultivate ourselves to be. There is a karmic fate, that can be understood as a force generated by action or a distinguishing emanation, which comes from a bidirectional compellation of nature and nurture within the complexity of the human being. Although it is an unchangeable truth that our DNA codes the messages to our health and wellbeing, and that those messages have been past down within an ancestral line, we are actually not destined to repeat, nor re-experience their karmic fate – good or bad. Indeed, though our genes are inherited, they must be “expressed”, “transcribed”, or (as you may have heard before) “switched on” in order to affect you. If a gene is not switched on it remains salient. This “switch” is the effects of the environment as it pertains to early childhood psychological and physiological nurturing, interpersonal and sociocultural relationships, as well as later life choices to become mindful. Accordingly, although in the past there has been confusion between correlation and causation of disease and disorder, we can now comprehend that the virtuous cycles of our wellbeing as (independent and differentiated) adults are actually created by our choices in how we care for ourselves as an interaction of physiological, psychological, and sociological flow (environment). is the basis of epigenetics! As aforementioned, in brief we are not destined to a fatalistic existence – though our ancestors past remain within our DNA, and indeed though we may have specific character proclivities, these do not restrain us. Research shows that although as infants we may have been exposed to adverse situations, and so too as adults there is a complex interplay of individual and social responsibility, there is also an abundance of evidence that suggests that individual change and the more accessible and controllable rudiments of genetics, and indeed any aspect of holistic wellbeing, comes from personal empowerment. When we feel connected intra and interpersonally, spiritually, and when we are in-tune with our physicality there is a resilient capacity towards the cultivation of progressive wellness. Empowerment from positive connection has the potential to create heritable change in the way the paradoxical continuum of who we are extends within our communities; thus having the potential to expand resilience and holistic wellbeing within culture and society – that is, we have the power, YOU have the POWER, to create karmic change both individually and socially – at the level of our genes! With this in mind, the question is how? While personal empowerment and the choice to make change is a seemingly straightforward concept, the reality is – as anyone who has ever made a choice to transform an ingrained habit knows, it is not as simple as it seems. The choice to change lifestyle, and thus the karmic fate of your genes, comes with the need for self and other appreciation, affirmation, and affection. Below we outline many ways in which you can empower change within the virtuous cycles of your wellbeing, at the same time there cannot be enough emphasis on empowerment and personal change within a supportive and aligned community. Primary to your holistic wellbeing is the need for connection with like-minded people – thus we remind you primarily of the power of practicing together and joining others in your journey to holistic health and wellbeing. Mindful and respectful sense making: Past, present, and future.